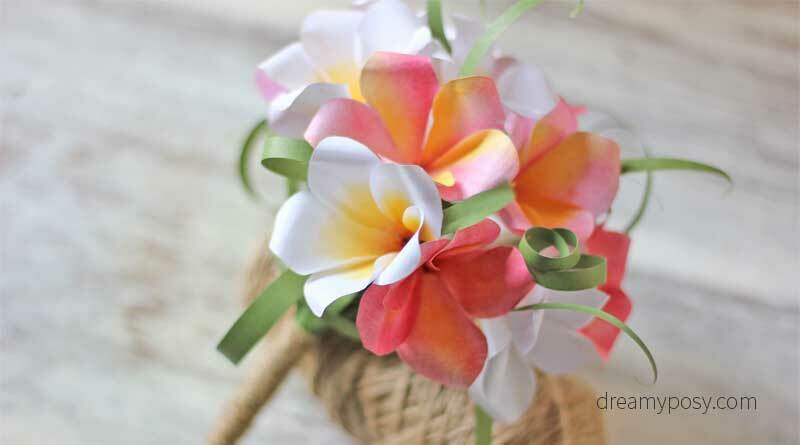 You could make this Plumeria paper bouquet with my FREE template and step by step tutorial. Just need a few hours and 4 pieces of printer paper. Why not DIY wedding bouquet? Download the free template. If you don’t have a printer, just apply a paper on your screen and trace the template with a pencil. 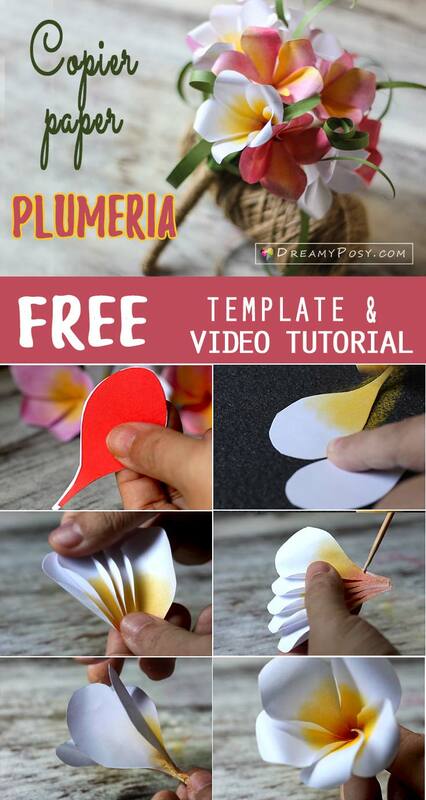 Cut the paper petals, each Plumeria flower will need 6 petals. Color the petal with pastel chalk. 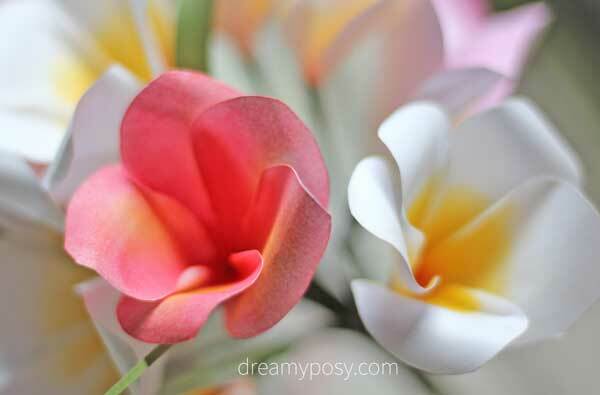 You could easily blend the color in various way, as the real Plumeria has many color themes. Use a BBQ stick to curve the petals as video instruction. Try to curve each petal again to make it more realistic. I provide completely free templates and tutorials on this blog and work hard to earn our living from the advertisements you see on each page. Really appreciate your support and look forward to your requests and comments. Wow wow wow!! Absolutely beautiful range of flowers. You are gifted. Thanks for nice words, Yvonne. I love your tutorials. I have bought plenty of different gsm paper but I like to work with something that is very readily available. Thanks for your very inspiring videos! Ohh my gosh…….finally I found a good template from my favourite flower in the whole wide world …. 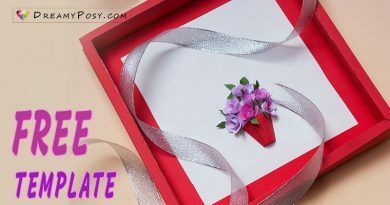 Thank you so much for sharing dese gorgeous template …..
Oh, thank you, Arina. I tried to promote my contents for years with the hope to reach out the like-minded people. I’m so glad that you found me and love my templates. Stay tuned, you will find more and more freebies soon. Love this. Could you let me know how you attached these to the florists wire? Dear Emmy, I just use small glue gun to attach. 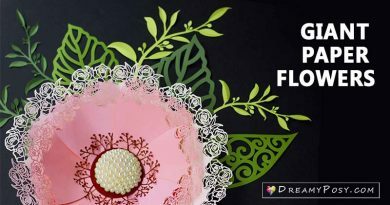 Pls help to see the Carnation tutorial, but the floral wire in this flower has no curve head. Glue gun is durable enough for such a light flower to wire gauge20. Then I use a brown floral tape to wrap all. 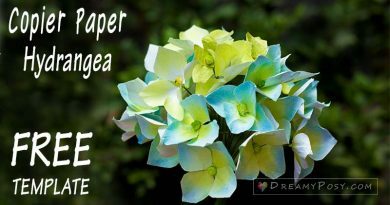 Could you make a tutorial on leaves that you use with your flowers? Thanks Andrea for passing by. I just cut out a long strip of green paper like a grass leaf, the length is about 10″, width is about 2/5″.